Freed a spot on my messy desk! I guess that is how the floor gets filled… Just moving piles around, not really knowing where to put them. I want to use all of this right now, so why store it away in a box where it might stay hidden for months. But in lack of space and time, I move things around and hope to use it… soon! 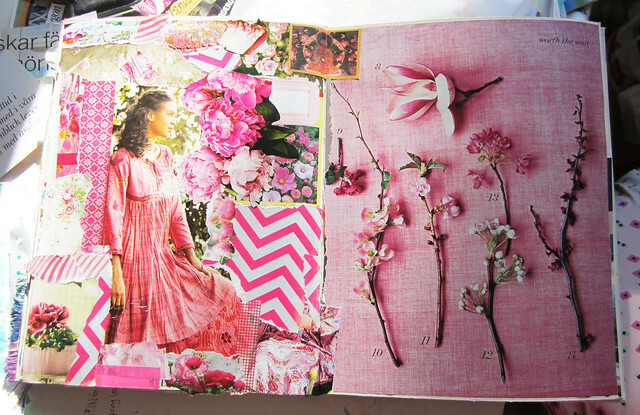 Roses, flowers, patterns, a pink dress and a entirely pink magazine page from my stash. I don’t think this is finished, but for now I am happy with it. Delighted! The awesome pink chevron paper above is a free printable by Mary Ann Moss, pinned a while back to my pinterest board of pretty patterns. I had no idea I liked chevron, but now I love it! You should also check out her handpainted labels! You can buy the whole back, and I think you should. I did and I love them all. They are so cute and inspiring! Plus, you can never have to many labels. Oh, if you’re new here, I once made a sheet of red labels you can download. Print and enjoy! This entry was posted in Art journaling and tagged art journal peek, cut + paste, exploring colour, printable. Bookmark the permalink. Denice, thanks for the sweet comment. So sweet of you to let me know you were visiting, I’m always happy to inspire! Your pink spread is so cuuuttteee!! I’ve nominated you for one of my top 15 for the ‘very inspiring blogger award‘. Great photo of all the delicious supplies on your desk…fun to see what you turned them into, too! I too take huge piles off my desk and just transfer them to the floor when I need space to work. You can’t imagine what things look like in my art room right now!! Lucy, what an awesome blog you’ve got going there. I hope you will have as fun with yours as I have with mine. And come by again soon. Thanks for the link love! 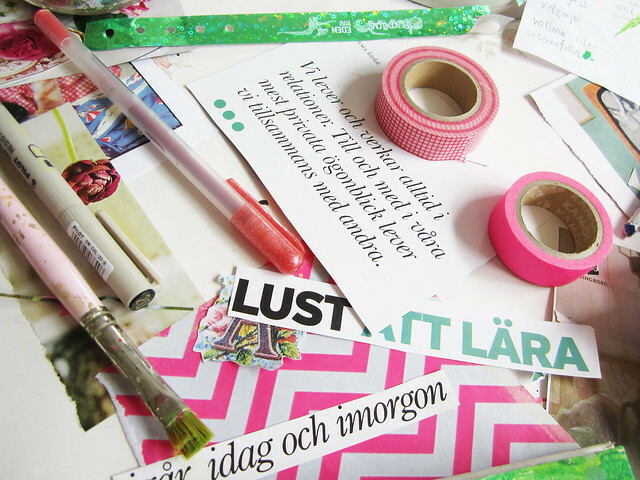 My husband asks me why I have to have piles of “stuff” (the svensk ord) :) all over the floor. I tried to tell him, if I put it away, I may forget about it, so I have to keep it close to me. Seriously, I also take stacks off of the desk when inspirations strikes, so it ends up on the floor. Glad att jag är inte ensam!